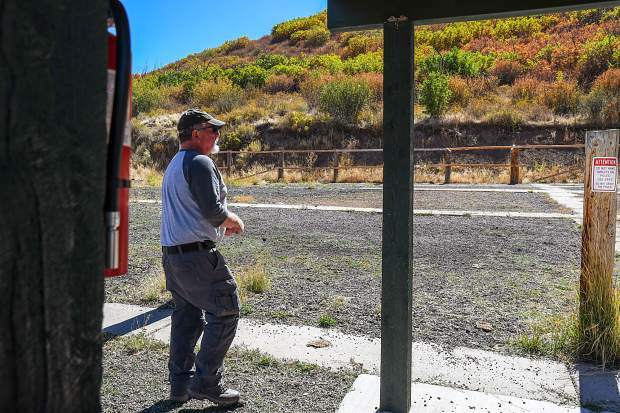 Glenwood Springs Gun Club President Ralph Delaney takes a walk through the South Canyon Gun Range. The Glenwood Springs Gun Club has dropped its National Rifle Association requirement of its members. The nonprofit organization, which has had leased rights from the city since 1984 in South Canyon, will begin taking member applications again in January. The window for membership this year ended Sept. 1. Glenwood Springs Gun Club President Ralph Delaney told the Post Independent that, although rates for 2019 applications have not been set yet, those interested may pick applications up, come the new year, at Big John’s Ace Hardware, Factory Outdoors, Bighorn Toyota, Phil Long Honda of Glenwood Springs or Saturday mornings at the South Canyon Sporting Clay Range. Previously, one could still shoot at the club without being an NRA member as long as they were with a club member. The club also hosted weekly events, which were open to the public. In addition, the club serves as a practice range for numerous law enforcement agencies. Delaney said the club has no paid employees, but rather volunteers, and that all proceeds go toward maintaining the club’s shooting ranges, paying expenses such as insurance or repairing and acquiring new equipment. “I am happy, not because there is not an NRA requirement because of the NRA as an entity,” Glenwood Springs City Councilman Jonathan Godes said. “I am happy because, now, if I want to go there with my gun and sight it in, I do not have to belong to a political organization. “I just do not like having public facilities or land be restricted based on your affiliation with national organizations,” Godes added. As previously reported, Delaney told the Post Independent that the previous NRA requirement of its club members was not meant as an exclusionary tactic but rather that the club needed insurance and its insurer was the NRA. “(The Glenwood Springs Gun Club) acted, I think, in a really responsible way. There were a lot of people that were concerned about it,” Godes said. The club still receives insurance from its same insurer according to Delaney and has no plans of changing its current insurance arrangements. “As soon as (the Glenwood Springs Gun Club) were able to hold a regularly scheduled meeting and discuss the topic, they brought it up in a great way,” Godes said. Because the lease adheres to five-year renewal terms, the current lease between the city and the gun club, which began again in 2016, unless renewed again, will end Feb. 1, 2021.